In 2004 we lived in France for 18 months. We often visited Simon’s parents in their village called Yzeures sur Creuse – but we mainly lived in a “station” house at the bottom of the hill of a little hilltop village called Lagraulet de Gers. English friends of ours whom we had met whilst traveling in France had purchased a house in Lagraulet and knew that we had sold our business in Darlington, Western Australia and were heading to France for a while. They asked us if we would like the opportunity of living in their house, to look after it and also do renovations for them for a year or two. They wanted to work for another couple of years and then retire and move to their house in France. The little house is called La Halte. Station houses in France are of a certain mould and quite distinctive. This one was built at the “barrier” and the station master would have been responsible for guarding the crossing of traffic whilst the train passed through. The track is now unused and is a walking track. Not far up this track is the path to Eauze which pilgrims walk on their way along the Camino De Santiago to Santiago de Compostela. We jumped at the chance – what an opportunity! Off we went. We had so many trials and tribulations with the renovations – funny and frustrating as we are so NOT “handy” type people. It was just like you read in all the books; “A Year in Provence”, “Toujour Provence” (Peter Mayle fame) . We had so many laughs and we kept the Brico Marche (hardware store) in business.. We met many other foreigners wandering around there too who were living in the area and renovating. Some had a command of the French language and some didn’t. We had a little but enough to be dangerous. Anyway – around that time Rick Stein was barging along the Canal du Midi which was just north of us. His route commenced at Bordeaux and he ended at Marseille. He visited a little town just off the Canal called Nerac and this was only 35kms from us. We enjoyed his style of cooking and have his book called French Odyssey. Page number 45 is very messy as I turn to this page a lot. As often as I make this recipe I never seem to remember the quantities of the butter, flour and cheese!! Gougere are a standard “mis en bouche” on our Peppermint Lane Lodge menus. Gougere are made with a choux pastry. Tip: The trick is to have everything cold and work quickly. Place COLD water and 75gms of COLD butter into a pan and leave over a low heat until the butter has melted. Meanwhile, sift together the flour and salt. When the butter has melted, turn up the heat, bring the mixture to the boil (NB: do not let the mix boil for too long as it reduces the liquid and you don’t want to do that) and add the flour. Vigourously beat the flour into the butter and water mix until it is smooth and comes away from the sides of the pan and let the flour cook “out” for a minute or two, then take off the heat and leave to cool slightly before gradually beating in the eggs to make a smooth, glossy choux paste. Beat in three quarters of the cheese. At this point you can put it into a container and freeze it until you wish to use it. If not drop heaped teaspoons of the mixture, about 3-4 cmd apart, onto a large, well greased baking sheet. Sprinkle with the rest of the cheese (or drop into the grated cheese and roll around to cover the entire ball) and bake for 20-25mins until puffed up, crisp and golden. Serve warm. Sometimes – if I am freezing the balls – I poke a little gorgonzola into the ball and then enclose the cheese. 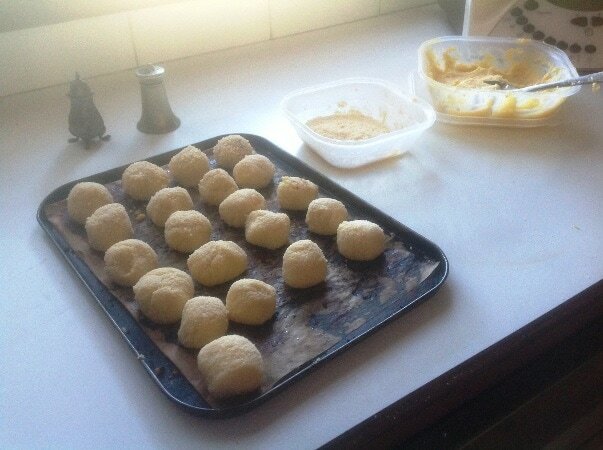 I like to freeze the mix and then take out at a later stage and when slightly frozen I form the balls (easier to work with), roll in cheese and re freeze. I then place then into a bag for an easy nibbly to serve when guests arrive. Good luck! And happy dining! If you have a favourite recipe, why not tell us about it in the comments section below? Don’t forget the Peppermint Lane Lodge Epicurean Weekend that’s coming up soon. Who’s coming?